In advance of their appearance in the 2015 Russell Athletic Bowl against the No. 17 Baylor Bears, the No. 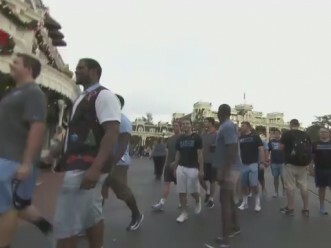 10 North Carolina Tar Heels spent Christmas Eve at the Magic Kingdom. The Tar Heels enjoyed attractions in the park, including a flight on Dumbo the Flying Elephant. Walt Disney World Public Relations is providing exclusive video highlights of the Tar Heels’ visit to media via DisneySportsNews.com now.